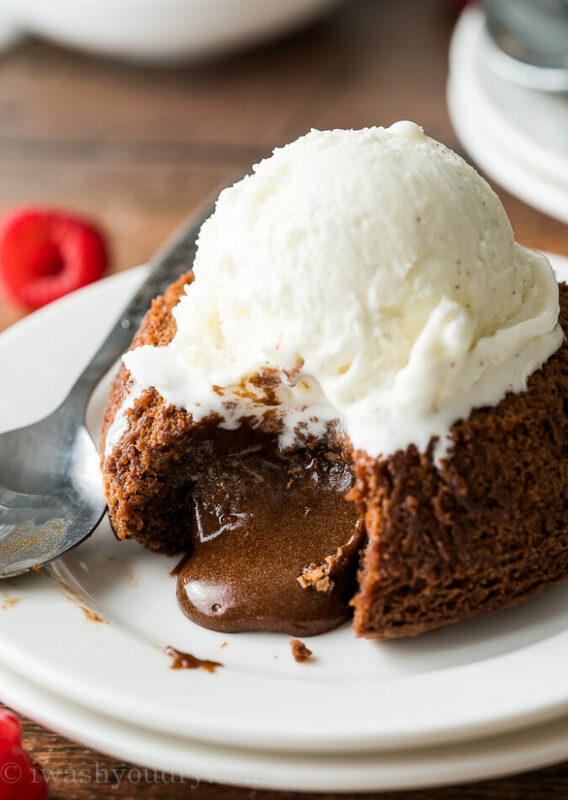 This decadent, yet easy Chocolate Lava Cake Recipe is just 5 simple ingredients, ready in about 25 minutes and makes the most romantic dessert ever! 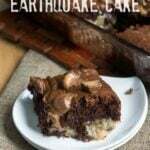 I originally shared this rich and gooey lava cake recipe back in 2012, but it was in desperate need of some updated pictures, as well as some updated recipe notes… plus I will never turn down the opportunity to eat chocolate cake. 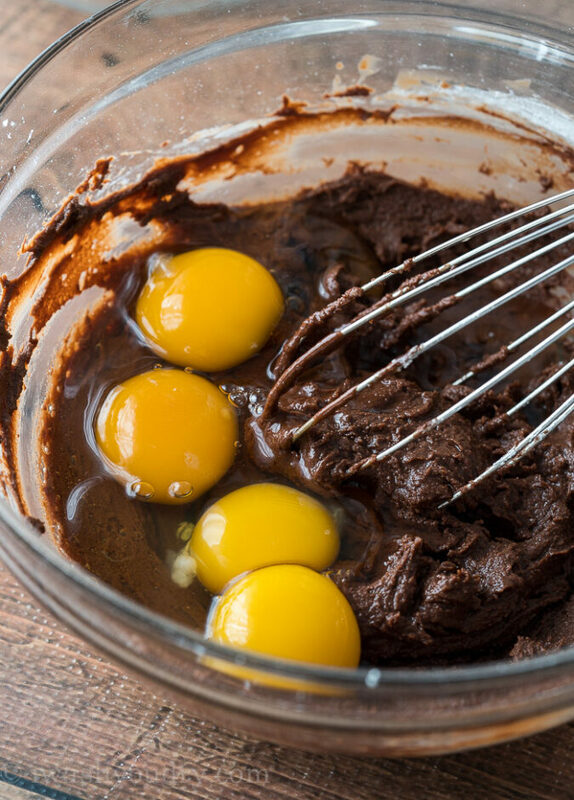 Start by melting together some butter and semi-sweet chocolate in a bowl. You can either melt the combination over a double boiler, or in the microwave. I prefer the microwave because it’s faster. 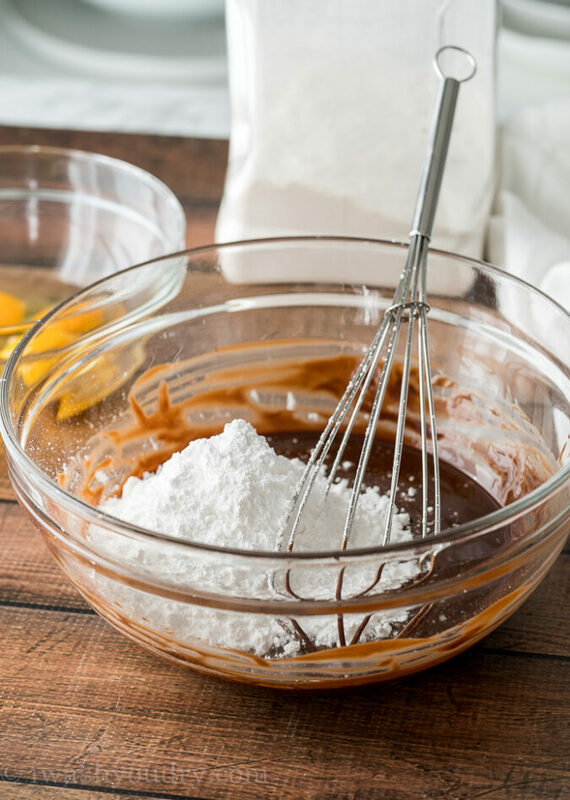 Whisk powdered sugar into the chocolate mixture until it’s nice and smooth. Add in 3 whole eggs and the yolk of another as well as some flour and whisk again until smooth. What is Inside Chocolate Lava Cake? 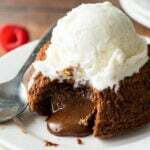 This Chocolate Lava Cake Recipe is baked at a high temperature causing the outsides of the cake to bake quickly, while leaving the insides of the cake a hot gooey chocolate center. YES! 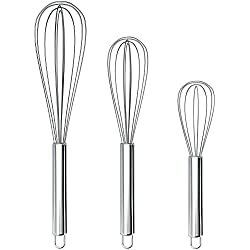 The internal temperature of the cake will rise above 160 degrees which is the safe temperature of eggs. You can check the temperature of your cakes to be sure. 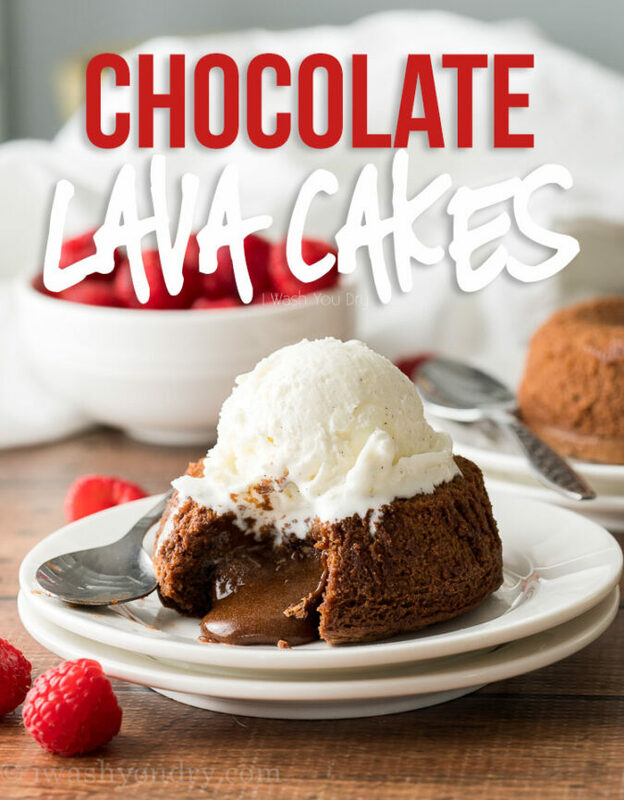 What Type of Chocolate is Used To Make Lava Cake? You’ll want to use a high quality chocolate for this recipe for best results. I use the Semi-sweet baking bars by Baker’s, Ghirardelli, Nestle, or Lindt. That being said, I have successfully used morsels (chocolate chips) for this recipe when in a pinch. You could also use bittersweet chocolate if desired. 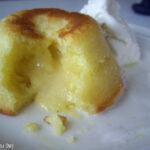 Here is a White Chocolate Lava Cake version as well! 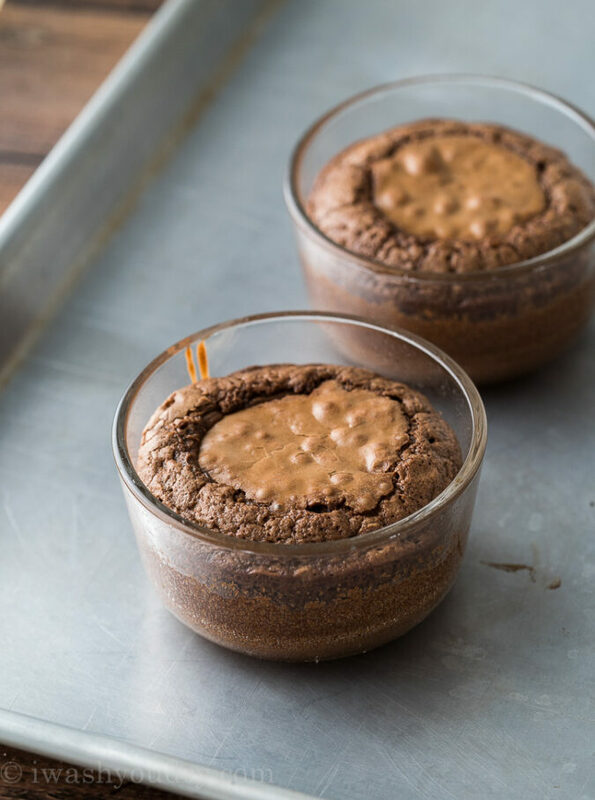 This recipe makes 4 chocolate lava cakes when baked in 6oz ramekins, but can also be prepared in a muffin tin (making 6 smaller cakes). Make sure to coat the ramekins or muffin pan with non-stick spray. I prefer to use the baker’s spray (the one with flour in it). 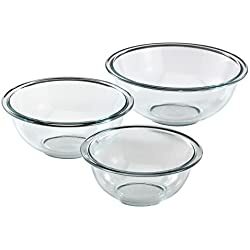 Place the ramekins on a baking sheet before placing in the oven for ease in removing. Make sure to let the chocolate lava cake rest for at least 3 to 5 minutes before inverting onto a plate to enjoy. The top of the lava cake will be slightly jiggly, but mostly set when you remove it from the oven, while the outsides should be set completely. If you’re having trouble getting the lava cake to release from the cup, carefully run a knife around the edge of the cake to help loosen it. Can you make these Chocolate Lava Cakes ahead of time if you’re having a dinner party? Can you FREEZE these Chocolate Lava Cakes and How Do You REHEAT Them? 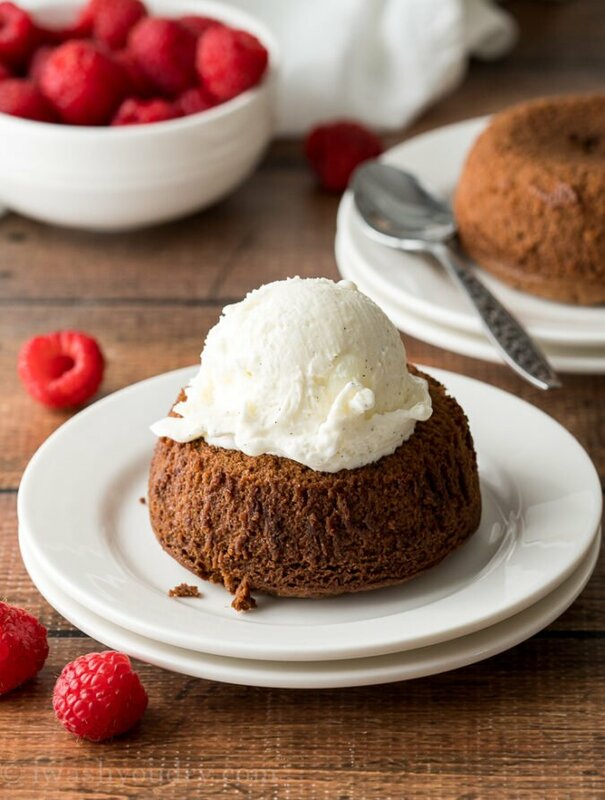 These Chocolate Lava Cakes are the perfect dessert to go along with your romantic Valentine’s Day dinner, or any time you’re needing to satisfy that chocolate craving! I’m thinking it must mean you have some bad eggs. Try again with some fresh eggs and see if the smell persists. I’ve never had an egg smell when I make these. A great recipe but I do have just one piece of advice that I REALLY hope you will take to heart. I made the cake exactly as you described but replacing the chocolate with white chocolate….BEFORE I saw the link to the white chocolate version….may I politely recommend that you reposition the link to the white chocolate somewhere higher on the page for those who–like me–were specifically looking for the now apparently discontinued white choc lava cake at Chilis. I made it for my wife’s birthday. yes, i used hersheys semi sweet chocolate chips, as for the coconut oil, this was the first time i used it. I stay in Qatar n it was pretty difficult to find a good brand coconut oil, and since i had no experience in using the oil, all i looked for was a muti purpose oil, which the supermarket guy said was used for cooking too. i guess, ill try the vegetable oil next time.thanks! This is years too late, but just wanted to mention for anybody else reading that the oil you used was most likely unrefined oil. It has a wonderful coconut smell and taste, but obviously not good for this recipe. That’s what I’ve been reading the comments for, to see if it would work. To get a neutral taste, you would want to use a refined oil. Coconut oil labels will say if it is refined or unrefined. I didn’t know the difference either until I bought a refined oil and it didn’t have the coconut smell and taste. my cake turned out just fine, very moist, soft n did not even crumble while taking it out to the dish but the chocolate topping on top gave me some problems. I used the quantities exactly as uve mentioned in ur recipe but my sauce had a very very strong coconut oil taste. To kill the over powering smell n taste of coconut, i added in more chocolate chips (about half as much as the actual quantity), but that didnt help at all. Then i thought of pouring the sauce over ice cream and maybe the mixed taste would be better, but sadly, that did no good. Although, the good thing was that the sauce took bout 20-30 seconds to harden but the taste really put me off. believe me, it felt like i was having brown color coconut oil with ice cream. I still have the sauce kept in a jar, do u think u can help me somehow to make it better…pretty plz! Hi Nida! Glad to hear the cake turned out well for you! As for the Magic Shell topper, did you use semi-sweet chocolate chips? I have tried 3 different brands of coconut oil, and I have not experienced an overpowering coconut oil taste. Is your coconut oil old or maybe a cheaper brand? I am not sure if there is a save for the topping now, but you could try using a vegetable oil instead of the coconut oil if you are not liking the coconut oil. Hope that helps! my son just whipped these up while i instructed from the laptop and we are waiting for them to bake. waiting is torture!!! I can’t wait! This is a really good recipe! I just tweaked it a bit by baking at 475 F for 8 minutes as that kept the cake’s lava molten. Maybe it’s just my oven that’s different. 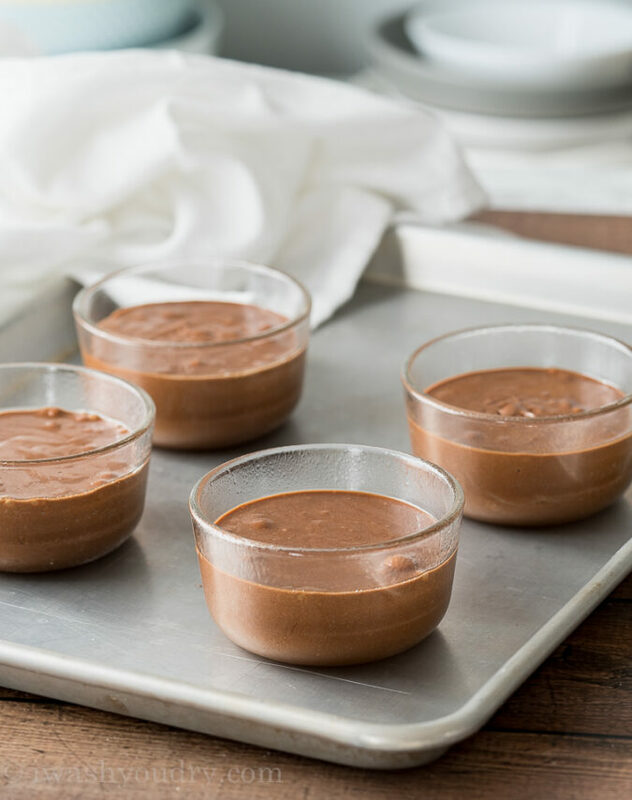 🙂 Really excellent recipe just like I had in my favorite dessert bar in New York, and this is a big hit among my friends. Thank you! I am sorry you feel that way Emily. I have always had rave reviews from anyone I have served it to. Maybe you missed a step in the recipe?? Is this able to be leftover and microwaved? I’d like to make it for my husband for Valentine’s day, but don’t want to spoil his appetite before dinner. Would it still stay gooey and molten if it sat in the fridge for a couple hours and then zapped it in the microwave? SHAWN, THANK YOU SOOOO MUCH! This was so easy to make and so delicious! I’m not the one that would impress you with my baking skills, so if I say I made and it came out delicious, anyone can make it! lol THANK you again! Just tried it, loved it. This is seriously dangerous in this house. Thanks! These could be dangerous knowing how to make them at home =). I totally love your blog, I’m trying to find the courage and patience to create a new site and switch it all over. You’ve totally inspired me though. 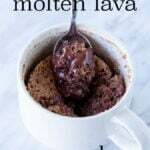 I love molten lava cake – this looks heavenly! I love molten cakes! looks so easy to make! Yup! I am all about easy recipes, so this one is definitely easy to make! Hey! I have the same recipe, but totally with a cake mix. Bahahaha. I am usually against cake mix, but sometimes you just gotta do it. Maybe not you, but I do. ANyway, miss seeing your cute face. Mwah! I am a huge lover of cake mixes. I think they are simple and easy to use, and that is my motto. I like this recipe though because it’s enough for 4, without a lot of extra left overs, and left overs = late night binges for me….hehe. Shawn, I think I love you. I love Chili’s version but this looks even better. Who knew it’d be so easy to whip up? 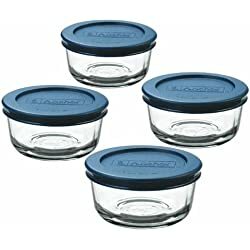 And I totally have those exact ramekins (and didn’t know they were oven-safe; bonus!) and that cutie IKEA dishtowel 🙂 love love love this recipe! Thanks Hayley! The towel is actually from Crate & Barrel, but I sure do love IKEA too! This looks amazing and hard to believe it was so quick to make too! I know right?! It’s crazy simple, and out of this world good! Oh my goodness Shawn. I need this in my life. Like, NOW. My mouth is watering! Seriously, get it in your mouth. It’s very good at stopping the watering-of-mouths. haha, thanks Mom! 🙂 Love ya!